Drawing upon the expertise of world-renowned researchers and experts, The Cloud Security Ecosystem comprehensively discusses a range of cloud security topics from multi-disciplinary and international perspectives, aligning technical security implementations with the most recent developments in business, legal, and international environments. The book holistically discusses key research and policy advances in cloud security – putting technical and management issues together with an in-depth treaties on a multi-disciplinary and international subject. 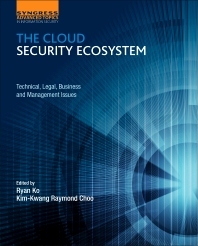 The book features contributions from key thought leaders and top researchers in the technical, legal, and business and management aspects of cloud security. The authors present the leading edge of cloud security research, covering the relationships between differing disciplines and discussing implementation and legal challenges in planning, executing, and using cloud security. 2 Who are cloud consumer and CSP? 1 Why is governance important? 2 What are the questions that boards should be asking? Dr Kim-Kwang Raymond Choo is a Fulbright Scholar and Senior Lecturer at the University of South Australia. He has (co)authored a number of publications in the areas of anti-money laundering, cyber and information security, and digital forensics including a book published in Springer’s “Advances in Information Security” book series and six Australian Government Australian Institute of Criminology refereed monographs. He has been an invited speaker for a number of events (e.g. 2011 UNODC-ITU Asia-Pacific Regional Workshop on Fighting Cybercrime and 2011 KANZ Broadband Summit 2011), and delivered Keynote/Plenary Speeches at ECPAT Taiwan 2008 Conference on Criminal Problems and Intervention Strategy, 2010 International Conference on Applied Linguistics and 2011 Economic Crime Asia Conference, and Invited Lecture at the Bangladesh Institute of International and Strategic Studies. He was one of over 20 international (and one of two Australian) experts consulted by the research team preparing McAfee's commissioned report entitled “Virtual Criminology Report 2009: Virtually Here: The Age of Cyber Warfare”; and his opinions on cyber crime and cyber security are regularly published in the media. In 2009, he was named one of 10 Emerging Leaders in the Innovation category of The Weekend Australian Magazine / Microsoft's Next 100 series. He is also the recipient of several awards including the 2010 Australian Capital Territory (ACT) Pearcey Award for “Taking a risk and making a difference in the development of the Australian ICT industry”, 2008 Australia Day Achievement Medallion in recognition of my dedication and contribution to the Australian Institute of Criminology, and through it to the public service of the nation, British Computer Society’s Wilkes Award for the best paper published in the 2007 volume of the Computer Journal, and the Best Student Paper Award by the 2005 Australasian Conference on Information Security and Privacy.